Here at The Family Panel, we don't just think it's Mum's who like a pamper, but our little ones too, so here's a guide to the best baby products available. Johnson's is a longstanding British brand- it's likely that when we were babies our parents used it on us too. I tried out their range of Baby Soft wash, lotion and cream on Little Tot's 1 year old skin. Johnson's is a quality brand, but affordable. And with the age of the brand, it's instantly recognisable on the shelf. He loved the bubbles that the wash created when poured in the bath, and it needed only a small amount to create a good amount, and with it being a wash for both body and hair as well it means one less bottle to buy and clutter the bathroom with. I feel this double use, and the small amount needed ensures value for money. The lotion and cream both have a satisfying smell, although I did find the lotion slightly runny and oily. However, both left Little Tots skin soft to touch with no irritation, and again only a small amount was required to cover his body from top to toe. The product that I liked most from the selection we tried was the Baby Oil gel. I used this on my own skin after a shower, and it left my skin moisturised without leaving me over oily, it's easy to use in the squeezy bottle it comes in, and it doesn't slip through the fingers like non-gel oil. All in all, Johnson's is a brand to be reckoned with-it's a trusted worldwide brand with staying power. We also tried Lush's bath ballistics, created especially for children. Big Tot loved watching her bath bomb fizz away, it turned the bath pink, and she loved the shape-it looks like a cherubs face smiling until it disappears in the water. Like Lush's adult products, they are made with natural skin friendly ingredients, and can be purchased online. They left the bath, and Big Tot, smelling lovely, without the chemically smell some bath products can produce. 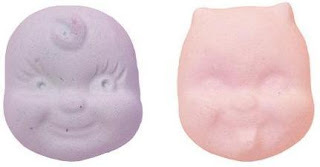 They have the most ingenious names for their bath products too- one is called the Ickle Baby Devil and the other The Ickle Baby Angel. They promise to have a calming effect to soothe your child off to sleep- and it worked, as she went straight off to sleep with no fuss. Priced at £1.35 each, they are technically not as good value for money as their Johnsons big bottle counterpart, however, for novelty value and keeping the not so happy to have a bath amused they are worth every penny! Next up are he new breed of supermarket offerings. Supermarkets now have a great own brand selection on the market, and some are a fraction of theprice of the more well known established brands. The packaging may not be as pretty as Lush's, and the names aren't as trusted, but with some costing under a pound, its value not to be sniffed at. 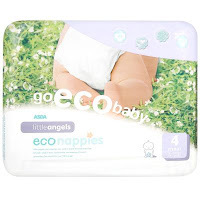 Firstly, Asda are just launching a new Eco range in store. The range includes nappies from newborn to toddler, all made with recycled materials and biodegradable, these are just as reliable as the major brands. Little Tot, who is a very active 1 year old who loves rolling around the floor and climbing up anything high enough experienced no side leaks, and they went through a whole night with ease. The fit is excellent. with no nasty red grab marks. They are competitively priced too- at £5.68, which is slightly more expensive than the Tesco and Sainsburys equivalent. However, I would pay the £1 extra as these were much more reliable than the nappies from these supermarkets. There are also wipes, (£1.96 per packet of 72 wipes) again made from biodegradable cotton. They are fragrance free to avoid irritating even the most sensitive of babies skins, and contain organic Aloe Vera and Chamomile. These were just right for bottom emergencies- not too wet and not to fiddly to remove from the packaging either. The bath products in the range come in simple packaging, in keeping with the "eco" theme, yet wouldn't look out of place on the bathroom shelf. They include baby lotion, shampoo, bath wash, and baby oil. All of them contain natural ingredients, including Chamomile and Witch Hazel, and all have been dermatologically tested, as well as being hypoallergenic, to make them safe to use for delicate skin. I used the shampoo on Big Tot, as it promises to be kind to the eyes. She truly hates having her hair rinsed due to the shampoo going in her eyes, and although she moaned, her eyes were free of the tell tale redness that can be left by some shops own brands. The baby lotion was applied to both the Tots and due to the lack of perfume it didn't leave a smell, but the cream itself was easily absorbed, without the oiliness of the Johnson's version. The best part about these products is the price- at just 98p for generous sized bottles, I can see these flying off the shelves. The value for money is excellent, and for those of us who care for the environment Asda cannot be beaten. Next up is Waitrose, and their Baby Bottom Butter. Waitrose is known as a more upmarket brand, but have recently branched out into a more reasonably priced no frills range. I was quite surprised to learn that they also have their own baby rnage, form which the Bottom butter is a part of. It was one of the companies best sellers last year, and not because of the effect it had on babies. It became popular with Mums too, who noticed that after rubbing it on their own skins, the thick and gorgeously creamy balm left their skin feeling soft, well, as a babies bottom too! And at £2.49, its a fraction of the price of high end moisturiser. However it is more expensive then some of the other supermarkets own brands, but it is worth the extra. Little Tot had experienced some teething related bottom rash, and the first thing that strikes you when you open the pot is that it really does resemble butter. It has a soft smell of Chamomile (which seems to be the most popular baby product), and includes olive oil to nourish the skin. However it is easily absorbed, and not oily as you'd expect it to be. The packaging is classy, yet simple, and has a screw top lid (anyone who has witnessed the results of their child opening a tub of Sudocrem will know why we think this is a good thing), it left Little Tots bottom blemish free without having to place a thick layer on over night. So, whether you chose online novelty items, or the trusted old school brands, there's plenty to chose from whatever your budget.